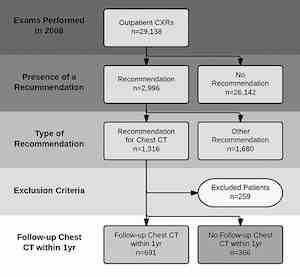 According to a new study published online in Radiology, a large percentage of patients who receive radiologist recommendations for Chest CT have clinically relevant findings. 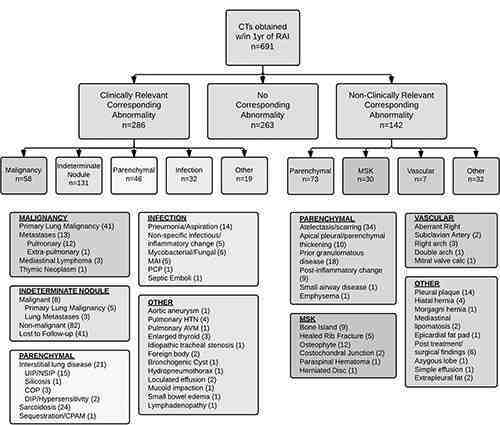 The findings thus demonstrate that radiologist recommendations for additional imaging (RAIs) after chest x-rays represent valuable contributions to patient care. RAIs have shown a tremendous growth rate of 200 percent since 1995. This massive growth has attracted scrutiny since healthcare is moving from volume-driven to value-based payment models. Emphasis is being made to ensure that the radiology community validates the clinical impact of its work. According to study author Tarik K. Alkasab, MD, PhD, from Massachusetts General Hospital and Harvard Medical School in Boston, “There has been a great deal of research on how radiologists recommend an imaging exam, but little on what comes out of the exams that they recommend. Prior studies were very broad, so in our study we tried to focus on a specific clinical scenario. Chest x-rays are the most commonly performed outpatient diagnostic imaging studies in the US. Nearly half of all RAIs arising from thoracic diagnostic exams are prompted by chest x-rays. During the study, the research team evaluated more than 29,000 reports of outpatient chest x-rays that had been performed at a large academic centre over a period of one year. They found that radiologists interpreting outpatient chest x-rays made recommendations for CT in 4.5 percent of cases. In 41.4 percent of the chest CTs, a corresponding abnormality was detected that required treatment or further diagnostic workup. One in every 13 yielded a corresponding abnormality representing a newly-diagnosed, biopsy-proven malignancy. According to study co-author H. Benjamin Harvey, M.D., J.D., from Massachusetts General Hospital and Harvard Medical School, these findings clearly show that the risk of radiation-induced cancer associated with a chest CT is of much less magnitude than the potential benefits of it. If the ordering physician sees a recommendation for chest CT, he should ensure that the patient gets the recommended imaging. The study showed that approximately one-third of patients in the study group who were recommended for follow-up chest CT did not receive the exam. The researchers point out that such oversight could result in missed or delayed diagnoses. The study team is hopeful that the findings will help improve the awareness of the importance of follow up chest CT. It is important for radiologists to be confident that their recommendations are valuable and are necessary for the long-term health of their patients. Figure 1. Schematic representation of the patient selection process. CXR = chest radiographic examination. Figure 2. Examples of lesions seen on chest radiographic images that prompted a recommendation for chest CT examination and the corresponding abnormality on chest CT. (a, b) In the first example, a nodular opacity (arrow on a) is seen projecting over the right posterior ninth rib in the chest radiographic image of a 50-year-old woman who presented with cough; the recommended chest CT examination demonstrated this to be callus from a remote rib fracture (arrow on b). (c, d) In the second example, a nodular opacity (arrow in c) is seen projecting over the left anterior first rib on the chest radiographic image of a 53-year-old man who is a former smoker and presented with cough; the recommended chest CT examination demonstrated this to be a suspicious nodule in the apicoposterior segment of the left upper lobe (arrow in d). On resection, this was found to be well-differentiated adenocarcinoma of the lung. Figure 3. Schematic representation of the results of follow-up chest CT examinations performed within 1 year of the index outpatient chest radiographic examinations that contained the RAI. AVM = arteriovenous malformation, calc = calcification, COP = cryptogenic organizing pneumonia, CPAM = congenital pulmonary airways malformation, DIP = desquamative intersti­tial pneumonia, HTN = hypertension, MAI = Mycobacterium avium intracellulare, MSK = musculoskeletal, NSIP = nonspecific interstitial pneumonia, PCP = Pneumocystis pneumonia, UIP = usual interstitial pneumonia.